I remember when all this were fields, as far as the eye could see. No, wait, I’m not sure this was ever fields, exactly, but I can remember when it was all film reviews made of graphs and silly poems and obsessing about Christopher Nolan and being freaked out by Catherine Zeta Jones’ face. Somewhere along the line I turned from a little read reviewer of films and loose advocate of the cinema experience into a zealous campaigner for the very fabric of cinema in the face of stubborn intransigence. Oh, and I do very occasionally still write film reviews. I have no regrets about the ongoing battle with the Competition Commission, and if anything I can see this changing my outlook and my blog forever. I now believe there is a national debate required about cinema distribution and the role of organisations such as the BFI to help ensure cinema can be seen in the right venues by those who hold it dear. In the mean time, I appreciate this might get a bit samey for anyone not living in Bury St Edmunds, Cambridge or Aberdeen reading this blog (and if you are by some freak occurrence living in Aberdeen and your name isn’t Dallas, please do say “Hi!” in the comments section), so this is an effort to get back to just talking about films for a bit. Normal service will never be resumed, ever, because there is no such thing as normal round here, and in a way I hope that’s why people will come back when all of the Competition Commission nonsense is in the past. So I have seen this one, and a review is imminent, but if you’ve not seen this in a cinema yet, indeed the biggest cinema you can find, then stop reading right now, take a photo of this page on your snazzy camera phone to prove for posterity that you did indeed stop reading right now, and head to your local cinema. If there was an Oscar for the Best Justification For The Existence Of Large Screens, Indoor Sunglasses And Obscenely Loud Surround Sound Systems then this would be as nailed on as Anne Hathaway bawling her lungs out in a charity shop reject dress. Is Joseph Gordon-Levitt a big enough star to justify putting his name in large font in the credits these days? One of those films you just know has a press pack somewhere with a cast listing of Golden Globe® nominee Joseph Gordon-Levitt (The Dark Knight Rises), Golden Globe® nominee Scarlett Johansson (Marvel’s Avengers Assemble), Academy Award® nominee Julianne Moore (The Hunger Games: Mockingjay, Jurassic Park: The Lost World), Emmy nominee Glenne Headly (Mr. Holland’s Opus) and Golden Globe® nominee Tony Danza (Cannonball Run II). Sigh. I even have the strange feeling that isn’t the first time that clip’s appeared on this blog. However, lesbians aren’t the most prominent feature of Blue Is The Warmest Colour. Nor are the repeated stories in the press of the travails and tortures that director Abdellatif Kechiche put his cast, or indeed my spell checker, through. No, the feature of this particular film most likely to draw your attention is its running time: 180 minutes. Where I come from, we call that three hours. (Actually, I call that THREE HOURS?!?!?!) Consider this low quality screengrab of the films over two and a half hours I’ve seen in a cinema since The Movie Evangelist bust forth into mewling infancy in April 2010. 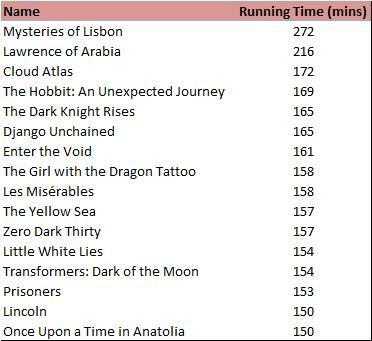 The top two had intermissions, so this looks like it could be the longest film I’ve seen in a cinema in one go, at least in The Movie Evangelist’s lifetime. Hopefully surgical stockings will be handed out at the door instead of 3D glasses to prevent DVTs. This month’s semi-obligatory dry indie comedy. Move along. I was in a radio debate a couple of weeks ago where the subject of subtitled films came up, as an example of how to tell the difference between a Cineworld-type cinema and a Picturehouse-type one. Proving that there’s an exception to every rule, it seems this Korean film is heading only to Cineworlds, possibly because it looks like Outbreak II: Epidemic Boogaloo. This entry was posted in Evangelism and tagged 2013, Blue Is The Warmest Colour, Doctor Who, Don Jon, film, Gravity, movies, The Half Dozen, trailer.